This Is Packed With Really Neat Information Too! 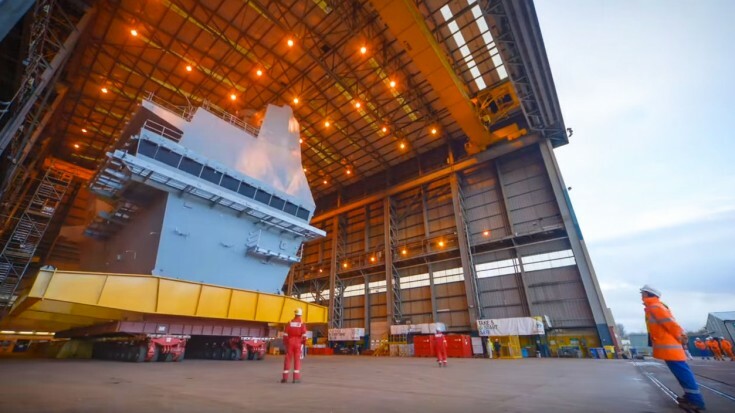 This is a really neat time lapse of an aircraft carrier being built in England. Named Prince of Wales, this Queen Elizabeth-class ship will be launched by the Royal Navy next year and is planned to be commissioned in 2020. Its construction started in 2011 and believe it or not took just five years to get to the point you’ll see in this cool video. With the whole vessel on the water already, the tower was built separately in a warehouse. Now, it was time to bring that “center of operations” out and attach it to the ship itself. The carrier has the capacity to hold 1,600 personnel. As you’re watching this, the producer of the video put in really neat facts here and there which is really eye opening. We all know carriers are massive, but when you look at small things and realize that it takes 15 million sq.ft. of paint to cover the carrier for example you’ll get a whole new different perspective of the work involved. Tying this to planes, this new carrier will also sport some new planes too. This includes 40 F-35B Lightning IIs as well as Merlin helicopters and other aircraft as well. Hope you enjoy all the factoids!